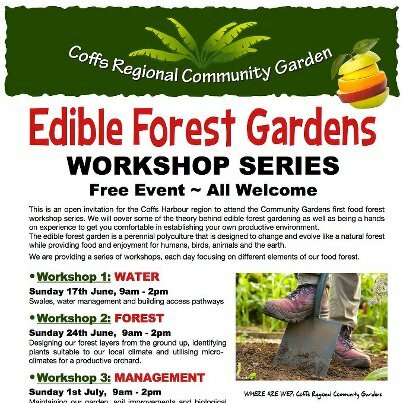 This is an open invitation for the Coffs Harbour region to attend the Community Gardens first food forest workshop series. We will cover some of the theory behind edible forest gardening as well as being a hands on experience to get you comfortable in establishing your own productive environment. The edible forest garden is a perennial polyculture that is designed to change and evolve like a natural forest while providing food and enjoyment for humans, birds, animals and the earth. We are providing a series of workshops, each day focusing on different elements of our food forest. Designing our forest layers from the ground up, identifying plants suitable to our local climate and utilising microclimates for a productive orchard. Maintaining our garden, soil improvements and biological pest control. We provide: Materials, machinery, plants, and knowledge. You bring: Enthusiasm, work clothes/boots, gloves, extra shovels or garden hoes would be appreciated. Have fun, be inspired, share in the abundance! Print article This entry was posted by Justine on June 13, 2012 at 9:39 pm, and is filed under Combine St Community Garden, Events & Workshops. Follow any responses to this post through RSS 2.0. Responses are currently closed, but you can trackback from your own site.